We model stress fields and potential areas of deformation, use differences to analyse the possible variations in the modelling results and investigate the relations between the earthquakes and our modelling results in the POLAR profile in the northern Fennoscandian Shield. Calculated stress fields show rather uniform distribution, with significant deviations concentrated in rheologically weaker regions, mainly in the middle crust. Significant areas of deformation are also connected to these weaker regions, in the crust and also in the mantle. These regions control whether decoupled or coupled mechanical conditions exist. 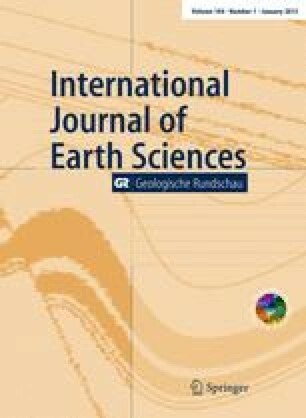 Further analysis shows that major differences between the stress fields calculated with dry and wet rheologies are found in the lower part of the middle crust extending from the Lapland Granulite Belt area towards the northeast. Similarly, differences between the models due to the varying heat production and the depth of the thermal lithosphere–asthenosphere boundary concentrate in rheologically weak crustal regions and in the mantle. These differences display importance of the rheological composition and thermal structure in rheological modelling. Our rheological model for reverse stress regime with typically used values of 0.35 for pore fluid factor and 0.75 for friction coefficient seems to result in too strong crust in order to explain satisfactorily the earthquakes focal depths in the POLAR profile. Most of the earthquakes can be explained by reverse stress regime if high pore pressure conditions exist. However, for the deepest events, it seems that also changes both in stress regime and in friction coefficients are needed. Rheologically, weak middle crust in the central and north-eastern parts of the POLAR could explain the absence of deep earthquakes in these parts of the profile. The authors thank G. Ranalli and an anonymous reviewer for their useful comments to improve the manuscript. All finite element calculations were done with the software package ANSYS™. Ansys is a trademark of Swanson Analysis System Inc.